The vice chairman of the executive board of Turkey's Kalyon Group, Haluk Kalyoncu tied the knot late Saturday with Yelda Demirören, daughter of Demirören Group's board chairman Yıldırım Demirören. 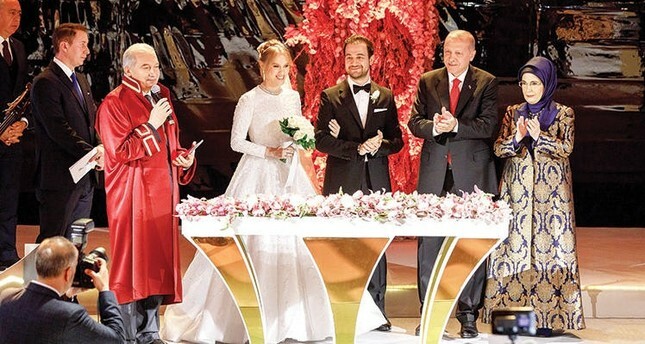 President Recep Tayyip Erdoğan and first lady Emine Erdoğan attended the wedding ceremony held at Istanbul's lavish Çırağan Palace as witnesses, while the mayor of the Istanbul Metropolitan Municipality Mevlüt Uysal officiated the marriage. Prominent figures from political, business and art circles were among nearly 2,000 attendees. Kalyon Group is a Turkish conglomerate, with major interests in construction. The company is also the owner of Turkuvaz Media Group, the parent organization of the Daily Sabah that also includes the Sabah newspaper and major Turkish TV channels AHaber and ATV. The Demirören Group, in which Demirören serves as board chairman, is active in the energy, mining, manufacturing, construction, tourism and real estate sectors. The group added Doğan Group's media properties, including Hürriyet and Posta newspapers and TV stations Kanal D and CNN Türk, to their portfolio in 2018. It previously acquired Turkish newspapers Milliyet and Vatan from Doğan in May 2011. The holding also owns a licensed website providing Iddaa betting options.